AWT Wild Schools blog: What have our elvers been up to? St Andrews school are keeping a close watch on their elvers to monitor and study their behaviour whilst taking part in our Spawn to be Wild Project funded by Bristol Water. Two dead eels were removed after the weekend. This is normal and in the wild there are some casualties, but we hope we don't have any more! The Eels were all in the corners until one of the pupils gave them some food. They all darted to try and get some. When they were not being fed, most of them were in the plastic float, weaving their bodies through the holes. Sometimes the Eels go on the floor and they are not moving, when they do this some people think they are dead but they seem to be just resting. When they do die, they turn a white colour. Most of the time, the Eels like to be in big clumps together. Most of the eels like to lie on the floor of the tank. ¼ of the eels where in the plastic tube. 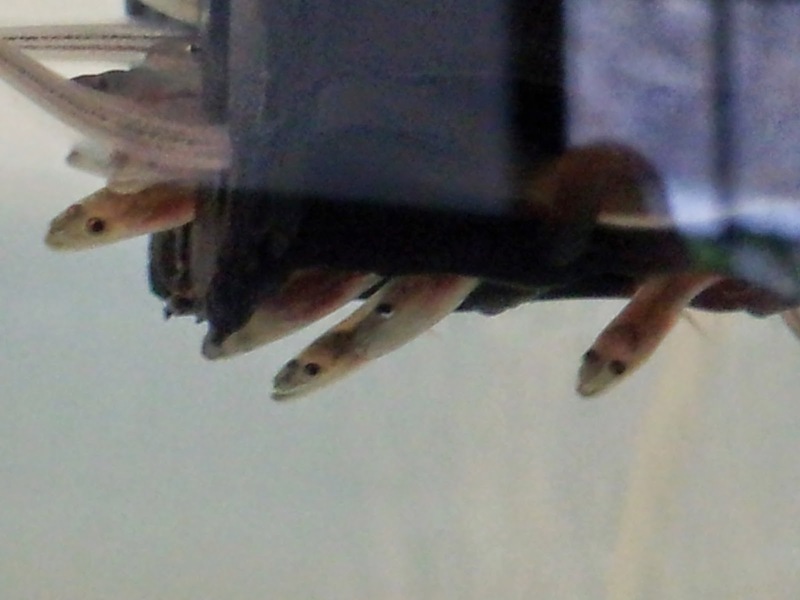 The eels are starting to realise when they are getting fed because when Shaun put his hand in the tank to release the food they all swam to the top and jumped up to try and get the food. Today the eels are feeding well despite a late serving of fish food. They are doing fine with no more deaths in the tank since the weekend. Also doing great with their tube thingy mbobby. The latest update on length is 7cm long. They tend to enjoy swimming at the sides in big groups rather than the middle. We looked at the eels and we noticed that they had little lumps under the tails. Also they are really growing but some are still the same size as they used to be. The eels all came to come up when they saw food coming. They were weaving in and out of the black tube. Today the eels were calm, we saw that one of the eels wasn’t moving and he looked depressed, but when we checked again it was wriggling. They have eaten well and we could see a little patch of poo. They were enjoying their toy. Thank you St Andrews, we can't wait to hear more about their behaviour. In the office at Avon Wildlife Trust they get fed at 12.30pm every day and have started coming out now ready for their dinner!